Sometimes (OK, all the time), there’s nothing more satisfying than popping a bite-size morsel of sweet goodness in your mouth. 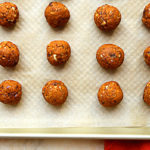 This recipe for Pumpkin Spice Shakeology Energy Balls is perfect for those times: All you need is five ingredients and 15 minutes, then you’ll be savoring the flavors of autumn in a snap. So, whip these energy balls up right now — your mouth will thank you! Pumpkin Spice Shakeology Energy Balls: All you need is five ingredients and 15 minutes, then you'll be savoring the flavors of autumn in a snap. Combine oats, almond butter, pumpkin, honey, and Shakeology in a medium bowl; mix well with clean hands (or a rubber spatula). Shape mixture into eighteen balls, approximately 1 Tbsp. each. Serve immediately (or store in an airtight container in the refrigerator).